While the benefits that HR can derive from people analytics is clear, how do they adopt these available tools and put them to use remains a challenge. Tune in to People Matters TV and learn from the experts. For decades HR has been described as a people’s function with the majority of the people in corporate holding the myth that HR has nothing to do with numbers. But this perception has gradually shifted with the advent of people analytics and its increased use in taking talent decisions. From recruitment to retention, predictive analytics is helping HR leaders formulate relevant and effective people strategies. With the help of data that HRs derive from analytical tools, they now have the chance to demonstrate ROI, helping to make the case for further investment and create a business impact. As predictive analytics allows one to forecast what’s likely to happen under different scenarios, as well as what drives outcomes, HR professionals are able to back each and every decision with the help of numbers. Employees are human and analyzing human behaviour often poses difficulties due to its dynamism and the need to take into consideration individual differences. These data points hence, not only help in tracking payroll, benefits enrollment or growth projection but also allow for the prediction of growth and longevity of an employee. For instance, EngageRocket, an HR Tech startup based out of Singapore provides a software-as-a-service platform that helps leaders and organisations make better people decisions using real-time data. Then there is the National Council of Social Services in Singapore which is grappling with a highly competitive employment market in Singapore and leveraging analytics for understanding both Singapore’s job seekers and the sector’s drivers to find the solution. While the benefits that HR can derive from people analytics is clear, how do they adopt these available tools and put them to use remains a challenge. HRs are still asking questions and struggling to effectively leverage predictive analytics to build agile people strategies. 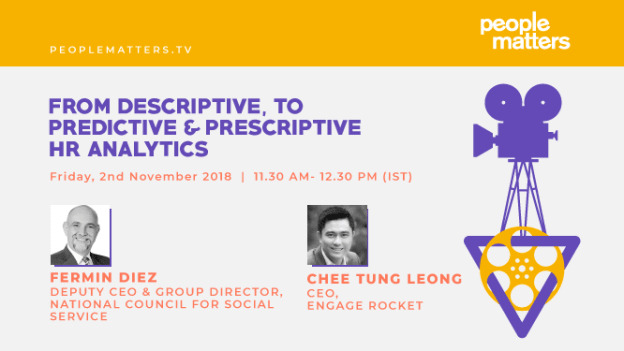 CEO & Editor-in-Chief, People Matters Media the expert speakers will bust some of the common myths about leveraging people analytics. Tune in and gather insights from the interactive live panel discussion to be held on People Matters TV at 11:30 AM IST, 2:00 PM SGT on Nov 02, 2018.